V. Sundramoorthy was appointed national coach of Singapore's national football team on Friday (May 27) afternoon. He will be the first local to take charge of the Lions since Vincent Subramaniam in 2000. The Straits Times looks back at the Republic's past head coaches through the years since the country's independence in 1965. He coached the national team from June 1964, winning both the Malaya Cup and Aw Hoe Cup twice in 1964 and 1965. He was sacked by the Singapore Amateur Football Association (Safa) in December 1965 following the Southeast Asian Peninsular (Seap) Games in Kuala Lumpur for "gross insubordination, but rejoined Safa's panel of coaches in 1967 to coach the national reserve squad. He was also in charge of the senior squad for that year's Merdeka tournament. Choo resigned from his coaching role in 1971 due to ill health. The former Bulgarian national coach was appointed by then Singapore Ministry of Social Affairs' sports department on a one-year contract. He was also the first expat to coach independent Singapore's national football team. 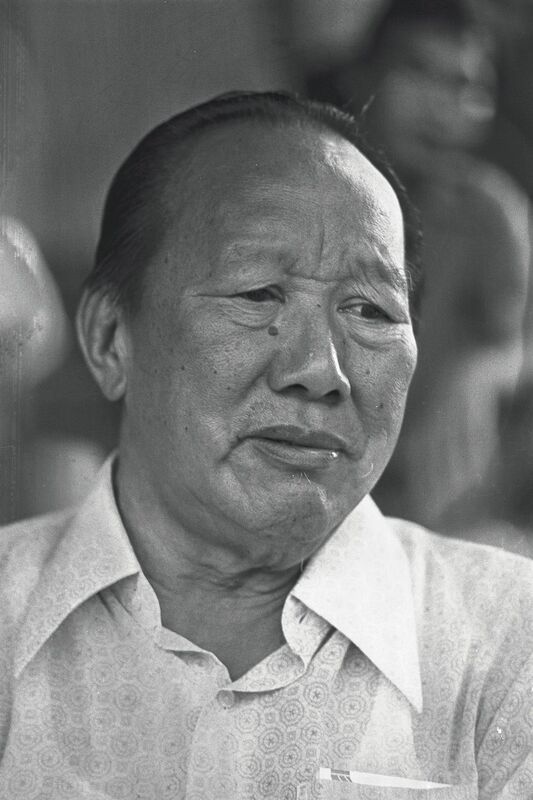 Yap was a certified British Football Association coach and helped to prepare the Singapore national team for the 1966 Asian Games in Bangkok, where the team finished fourth. He left the post in 1971 because of pressure of work. The Englishman arrived in Singapore in September 1972 and set his sights on winning the 1973 Seap Games and 1974 Malaysia Cup, both of which failed to materialise. His last chance to win silverware came in the 1974 Merdeka Cup but he was undermined by star players who had decided to take a rest during the tournament. He was appointed as an interim coach in October 1974 and was assisted by fellow coaches Kejapathy, Hussein Aljunied and Andrew Yap. The Fifa-trained coach's first spell in charge of the Lions was a turbulent one. He led Singapore to a bronze medal at the 1975 Seap Games in Bangkok but went into temporary retirement in late 1976 after the announcement that ex-national coach Choo had been appointed to the national team coaching panel. 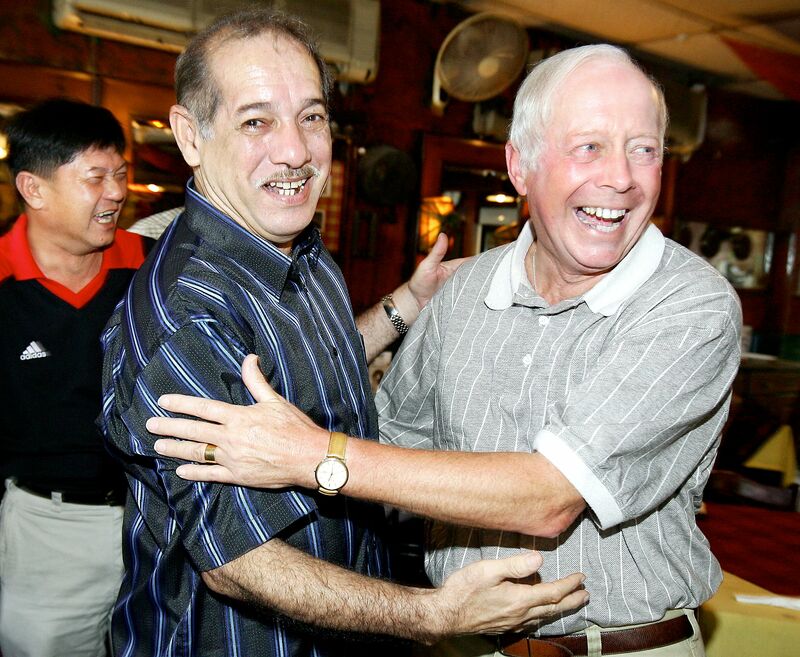 Hussein would return to assist Choo and together they led Singapore to victory in the 1977 Malaysia Cup. The former West Ham United player spent two years as manager of English club Bournemouth from 1974-1975. He then arrived in Singapore and joined the national team as advisor and director of coaching in 1976. He also filled the role of caretaker national coach on several occasions during his stint in Singapore. The highlight of Choo's fourth stint in charge of the Lions was the 1977 Malaysia Cup triumph but it was also plagued by reports of dressing room unrest. In Sept 1977, his right leg was amputated after an infection caused by diabetic gangrene. He was later relieved of his coaching duties. He was offered the job in December 1977, having coached the national youth team. Quit his job on June 18, 1978 when Singapore lost to England 8-0 at the National Stadium. The army regular took on the role of national coach in August 1979, and quit in June 1984 as he wanted to focus on his army career and spend time with his family. During his tenure, he led the Republic to victory in the 1980 Malaysia Cup. In his second spell at the helm, Hussein guided Singapore to a silver medal at the 1985 SEA Games and the Malaysian League title in the same year. The army warrant officer, who had to juggle his day job and his part-time duties with the national team, ended his term in December 1986. The former national captain, who completed an 18-month football course at Cologne University in West Germany, was a strict disciplinarian. He was given a two-year deal to coach the Lions but could only manage two Malaysia Cup quarter-final finishes. He returned to the the helm after repeated overtures from the Football Association of Singapore (FAS). He took on a one-year contract in 1989 but rejected the 12-month extension to focus on his business. The former national striker (1965-1972) took Singapore to the 1990 Malaysia Cup final but lost 3-1 to Kedah. He stepped down in February 1992 to coach Balestier United. 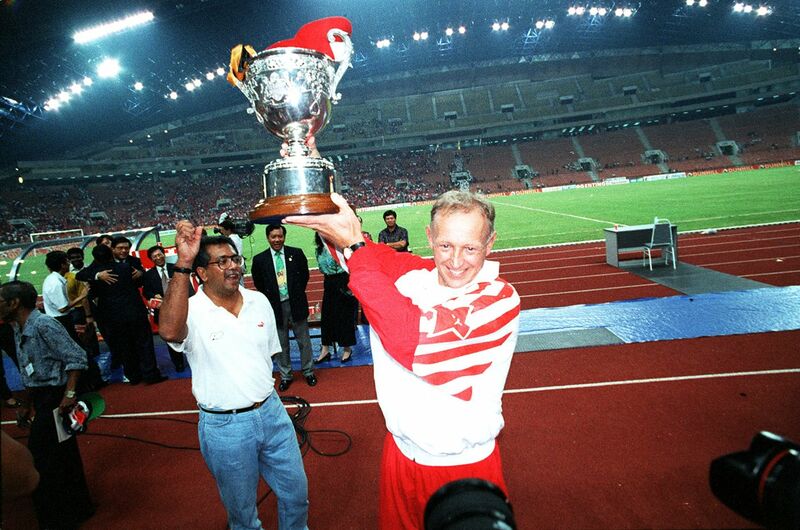 The Czechoslovakian was the mastermind behind Kedah's 1990 Malaysia Cup victory over Singapore. He signed a one-year deal with the FAS but chose not to extend his contract after his appeal for a 15 per cent increase of his monthly salary was rejected. Previously Kvacek's assistant, Sivaji was offered the top post and steered the Lions to the 1993 Malaysia Cup final where they faced familiar rivals Kedah and lost 2-0. The Englishman was given a two-year deal by the FAS but quit the post just three months into the job in March 1994, just before the Malaysian League season was due to start. Then FAS secretary Tan Eng Yoon claimed the association did not know the reasons for his departure. A late replacement for Worden, Moore found immediate success with the Lions. With star strikers Abbas Saad and Fandi Ahmad in the team, the New Zealander delivered a historic double in 1994, capturing the Malaysia League title before adding the Malaysia Cup trophy, the country's first since 1980. Whitbread was first appointed as assistant technical director to then national coach Moore in 1994. 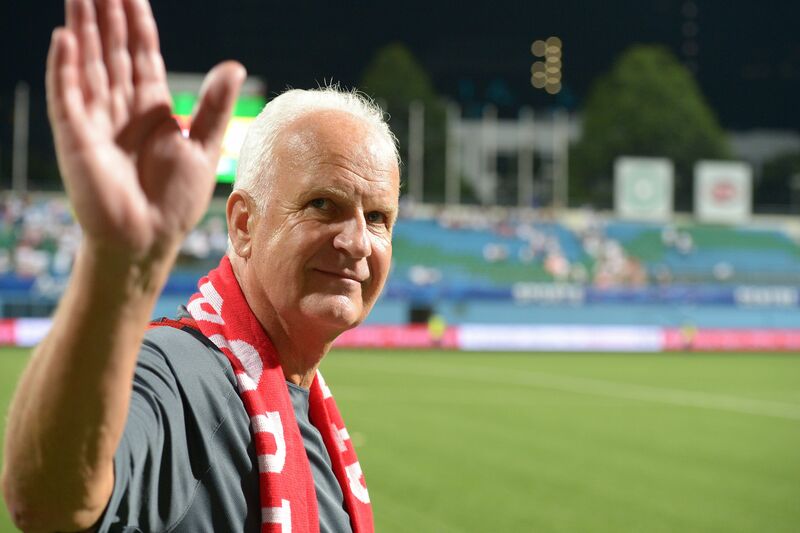 He eventually took over the post a year later when Moore was appointed chief executive officer of the S-League. In 1998, Whitbread created history by guiding Singapore to victory in the Tiger Cup (now know as the Asean Football Federation Championship). It was the Republic's first major international title. He left in December 1998, citing family concerns. He won two S-League titles with SAFFC in 1997 and 1998 and took charge of the Lions following Whitbread's departure. Under his watch, the defending Tiger Cup champions crashed out of the group stages of the 2000 edition. He was sacked soon after. The Dane arrived in 1999 as FAS' technical director and eventually replaced Subramaniam as national head coach. Singapore hosted the 2002 Tiger Cup but a semi-final run was not enough for Poulsen to keep his job and he was terminated in 2003. A former goalkeeper with Yugoslavia, Avramovic was hired in July 2003 by the FAS after a six-month search. 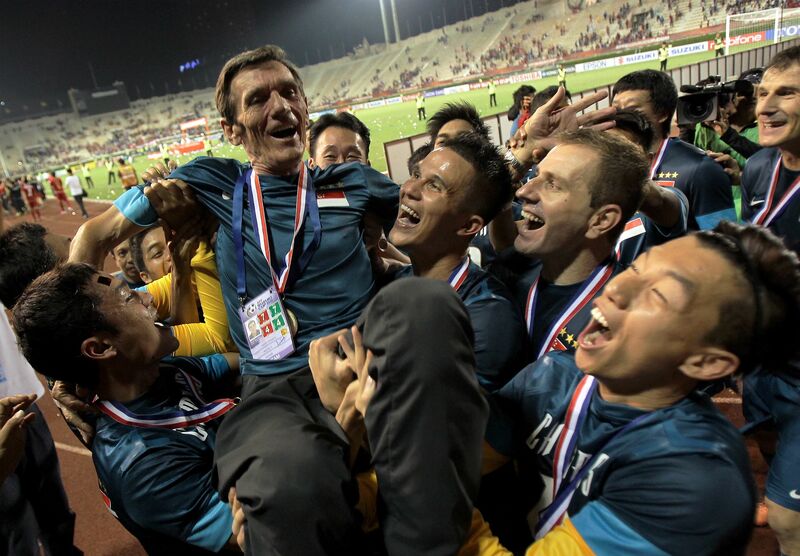 The Serb became Singapore's longest-serving coach and also the country's most successful. Under his watch, the Lions claimed three AFF Championship titles in 2004, 2007 and 2012. Singapore also reached the third round of the 2010 World Cup qualifiers, the first time it had progressed that far. After almost a decade at the helm, Avramovic stepped down in December 2012. The German arrived in May 2013 with an impressive resume that included stints in charge of the East Germany, Iraq and Belarus national teams. He did not win any major silverware during his term but presided over some noteworthy performances, including beating Asian giants Syria 2-1 in the 2013 Asian Cup qualifiers and securing a goalless draw away at Japan in June 2015 as part of the 2018 World Cup qualifiers.